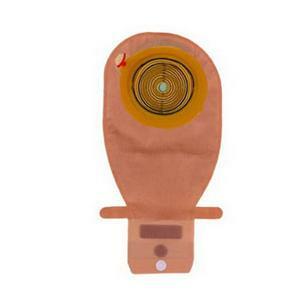 Large size, drainable pouch is soft, comfortable and discreet, and ideal for people with colostomies and ileostomies. Features Assura double-spiral adhesive that is permanently fixed to the pouch, yet will not strip the skin upon removal. A wide outlet that is easy to drain, and an optional filter for discretion. Soft cloth, opaque material is both odor-proof and reduces noise, making these pouches a good choice for both comfort and privacy. EasiClose Wide outlet is hygienic, secure, and easy to empty.